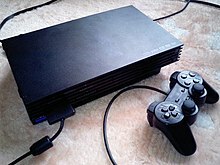 The PlayStation 2 is Sony's second video game console. It was released in March of 2000. The one before this was PlayStation (or PS1). The next PlayStation is PlayStation 3 which was released in November 2006. The controllers of the PlayStation 2 and PlayStation 3 are the same but the PlayStation 3 is used wirelessly and doesn't have an analog button. Some games are online e.g. Call Of Duty World At War Final Fronts and a few connect with the PlayStation Portable (or PSP). The PS2 is very successful and games are still made for it. The PlayStation 2 is the world's best-selling console. It has sold around 150 million units since its launch in March 2000, and is fully compatible with PlayStation (PS1) games. It competed with the Nintendo GameCube and the Microsoft Xbox. Sony announced that they had discontinued the PlayStation 2 on January 4, 2013. The PSX was released in 2003. It was a video recorder that allowed you to play PlayStation 2 games. It had a built-in hard drive (up to 250 GB). It did not sell well, because it cost too much money, so was not released outside of Japan. Gta San Andreas became the most sold Game with Over 27.5 million copies sold. ↑ "PlayStation 2 manufacture ends after 12 years". The Guardian. Retrieved 2013-03-25. This page was last changed on 28 January 2019, at 10:42.